Choosing the right roofing material for your home is one of the most important things that you can do. Not only is your material selection going to impact the total level of durability you are able to get out of your roof, but it can determine how much maintenance your roof requires over the course of its lifetime. The key to finding the right roofing material comes down to several factors. Below, we will discuss some of the major factors that should go into your decision-making process with your roofing contractors. Wood shingles are one of the most popular roofing materials for homeowners. A lot of people enjoy the traditional look that they offer. However, if you live in a very dry climate or area, you will want to be sure to look for properly treated wood. You want to find Class A fire rated wood in order to ensure that you are getting wood that has been treated with fire retardants. Wood Shingles tend to be easy to install. Therefore, they can be put up much quicker than some of the other options available which lead to less labor. However, there are concerns with wood shingles in certain wet climates that feature a lot of rain or snow. After all, wood can split, rot, or even grow mold. A lot of homeowners love the traditional and rustic look that they are able to get from wood shingles. You can find these shingles available in all different kinds of wood which make it a great option for those that want a specific look. This is one of the least costly options. Unfortunately, wood is prone to rotting. Thus, you will likely want to steer clear of wood if you happen to live in a very wet climate. Likewise, if you are located in a very dry climate, you want to be sure that the wood you are getting is treated with a proper fire-resistant coating. Another common type of roofing material that you can select would be asphalt shingles. These are the absolute most commonly used nowadays because they offer good value for the money. Along with this, they happen to be very durable for those that might live in harsh weather climates when properly reinforced with something like fiberglass. They are also easy to install and come in a variety of stylistic options to consider. One of the bad things about asphalt shingles is that they tend to break down much quicker than other options and they will likely require much more maintenance over time. They can work with a variety of different kinds of housing structures which make them a viable option to consider for anyone. As noted above, you are going to get a lot of different color options to choose from. 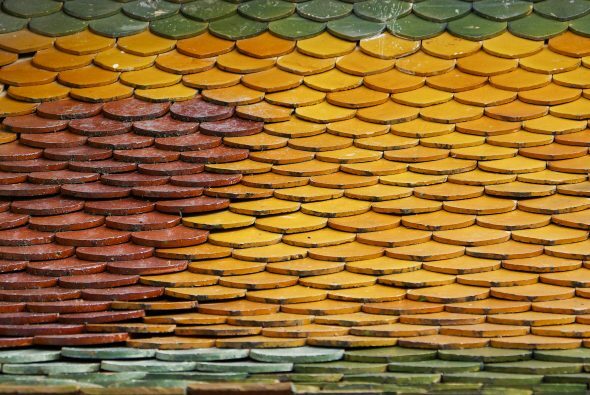 This should make for a roofing choice that can match your home’s aesthetic. As noted above, asphalt shingles tend to break down much quicker than some of the other options that you will be able to choose from on the marketplace. Asphalt shingles also have poor insulation that you might get inherently with other roofing materials. Metal roofs are typically some of the most durable options that you can choose from on the marketplace. Not only are they extremely resistant to various extreme weather conditions, but they come in a variety of different metal types offering both increased durability and lightweight designs. They can come in various metals including; zinc, copper, aluminum, and even stainless steel. A lot of the metal roofing options are extremely lightweight. The metal that is eligible to be used in metal roofing is some of the most durable materials that you will find on the marketplace. It is going to last much longer than wood or asphalt. Because metal is able to reflect heat, you can achieve better home efficiency with a roof like this. The biggest downside to metal roofing is the cost associated with it. Metal roofing can end up being a very hefty investment. Slate is a roofing material that offers a very unique aesthetic. Not only is it a much more premium look, but it comes in a variety of colors which can really make your roof stand out. Slate is a very durable material that offers everything from natural fire resistance to protection from extreme weather conditions. Slate is a material that can be recycled which make it a much more Eco-friendly option. You are not going to find a roof that offers the type of elegance and style that slate does. The cost of the slate is very expensive which means you need to have a big budget to accommodate this type of roofing. Because slate is such a heavy material, it can be much more difficult to install than the other materials discussed above. Also, it requires additional framing to house the slate. Figure out how much you are willing and able to pay for your new roof. Once you do this, you should be able to figure out what materials are ideal based on budget concerns. Depending on the climate your home is located in, you are likely going to have varying durability requirements. Overall, there are a lot of different materials that you will be able to choose from if you are looking for new roofing material. The key to choosing the right roofing material for your roof comes down to figuring out what your budget is, thinking about maintenance requirements, and figuring out what goes well with your house in terms of aesthetics. Some roofing materials might go well with one home and not look great with another. You want to find the right material that fits the overall aesthetics of your home just as much as your durability requirements.